A little known project that raised half a million to develop a new goods tracking service so that you pay through a smart contract only after delivery, has today closed shop. That announcement has now vanished with the Confido subreddit turned into private, but this is the internet, so we have a screenshot of it. Description of Confido Founder by the project. Doorn doesn’t quite say what the legal problem is, specifying only that it has something to do with a contract they signed. It is not clear, however, whether they signed the contract before or after the project was launched. Some suggest it might have something to do with a no compete clause, perhaps by one of their former employers, but that is speculation. In any event, whatever it is, their action has been swift and all encompassing. Their twitter is deleted, so too the linkedin profile of the founder, with their reddit closed and the website down. The project, in effect, has suddenly vanished. The most important question at this stage is where is the money. On their ICO page they say it is held in escrow by Kraft & Wurgaft, P.C. Google does not seem to know of any Kraft & Wurgaft, P.C. It does provide some somewhat close different spellings of law firms, but none precisely named Kraft & Wurgaft, P.C. Was it misspelled? The rest of the now deleted website appears to read fine. Or is it simply the case that this law firm doesn’t exist at all? “Confido works by using smart contracts with a unique shipment tracking feature. When a new transaction is made by a user, Confido will generate a smart contract using a secure smart contract template and the data entered by the user. That smart contract will act as the escrow between buyer and seller. The concept sounds good. They also have a screenshot of the app, but is that an alpha version or photoshop? Moreover, although the project is simple in concept, it is quite complicated to implement. It mentions a tracking code, but how does the smart contract know that the status of the tracking code has been changed? Can it communicate with the delivery services? 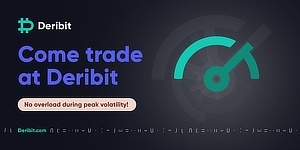 That considerable demand led to a significant price rise once it was listed on exchanges, with the token rising to a market cap of as high as $10 million, giving its investors a return of 20x or more. Until earlier today when it plunged some 80%, with price and market cap returning to near the ICO levels, erasing all gains. 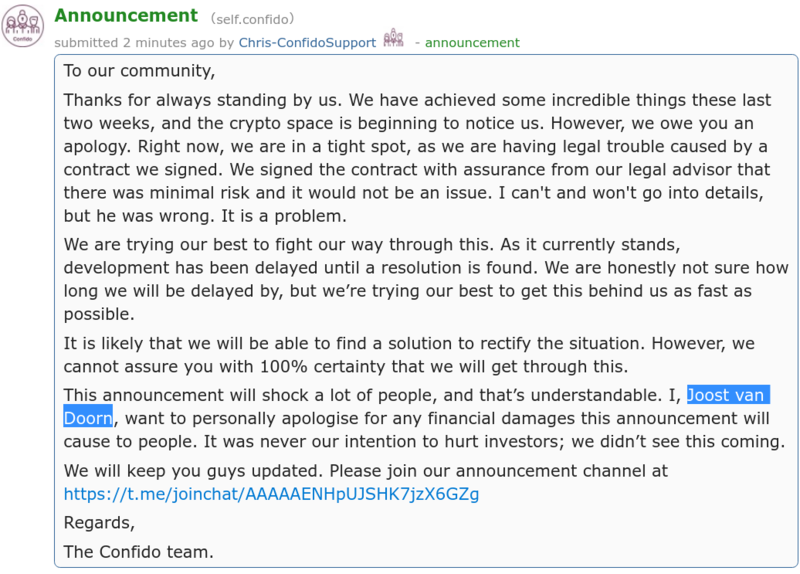 Understandably everyone is trying to get rid of any Confido holdings they may have, but the way this project is closing down is very curious and the lack of any detail regarding the contract does raise eye-brows. If it was a no-compete clause, then the founder could have just said so. If all of the project related media is being deleted to erase any evidence, then the founder must be aware everyone is screenshoting every bit of it right now. 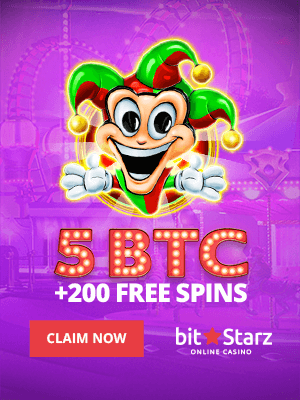 On the other hand, they did have a nice concept and project, receiving nearly half a million in initial investment while further enjoying gains in the increase of their tokens. So it would be quite puzzling if they intentionally decided to just burn it all down without good reason. In any event, this curious mystery is not ours to solve, nor is it for us to decide whether they would have been more in legal trouble with whatever contract they signed or with the SEC if the latter decides it might have some jurisdiction.